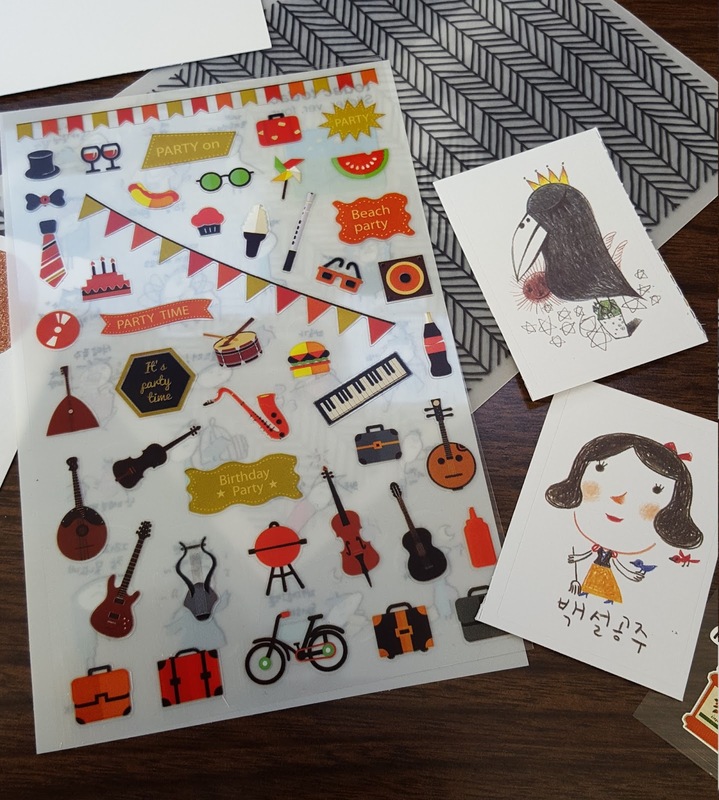 What: Pipsticks is a sticker subscription. That's it. Just awesome stickers from around the world. Depending on which plan you subscribe to, each sticker pack will contain 7-15+ sheets of stickers along with other fun paper extras. Sticker packs are marketed as either Pro (adults) or Kids, and two sizes are available for each demographic. Here's a little known fact about me: I started collecting stickers when I was six years old. But that's it. I collected and collected but never used any. I mean why would I? They were so pretty and if I used them I'd run out and have nothing pretty to look at anymore. Besides, cash to buy new stickers isn't easy to come by when you're in elementary school, ya know. 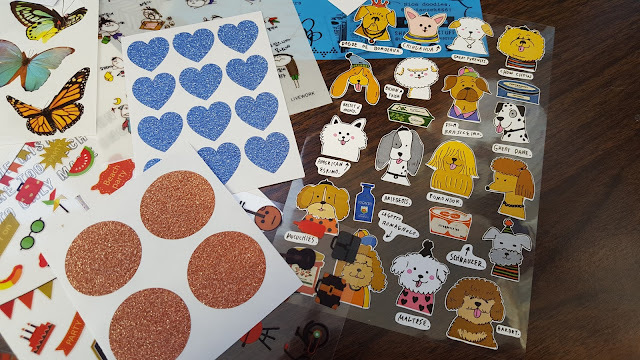 As I got older I realized that the point of stickers is not to selfishly hoard the shiny bits for my own satisfaction, but instead to share the joy with others. Stickers add a certain cute factor to anything you put 'em on. It's almost impossible to stare at a card with a puffy unicorn sticker and not feel warm and tingly inside. You won't believe how badly I wanted to put stickers on all of my college reports hoping they'd boost my grade just a little. This month's Petite pack is centered around the idea of Cutting Loose. Collect stickers, create things, enjoy life. 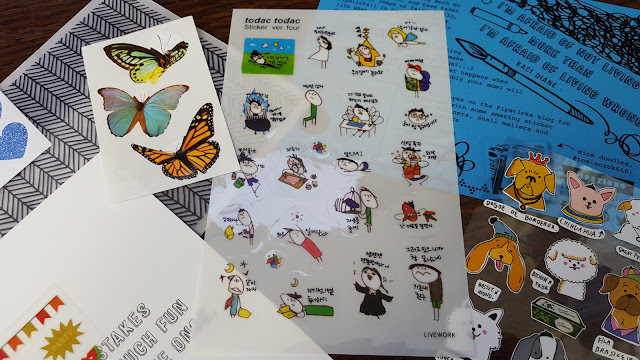 I believe this colorful sheet of stickers comes from Korea and is filled with kid drawings of people doing what they love - lounging in the grass, eating, reading, watching tv - stuff I wish I made more time for. These dog stickers are probably my favorite in the bunch. I love how all of the white dogs have rosy cheeks. It makes them look so cheerful and that makes me happy. This is what I mean by stickers spreading joy. And you can't tell from the photo but those bronze circles actually have wishbone cutouts in them. Not sure what I'd use them for (make-a-wish birthday cards?) but it's still kinda cute. A bunch of items symbolic of cutting loose: hibachi while playing guitar (a typical BBQ where I'm from), suitcases for a much needed vacay, and seriously who doesn't have a good time at a birthday party? 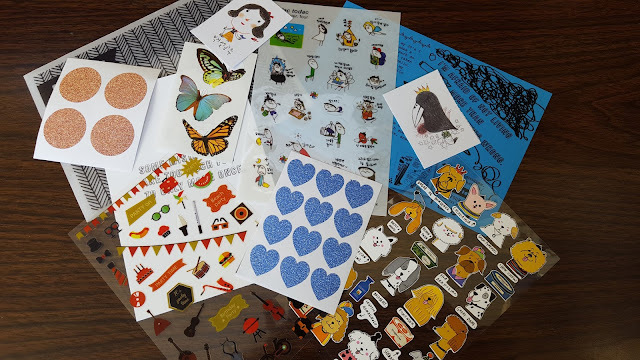 Last month's pack was cat-themed and came with a large assortment of stickers. I won't go through them in detail here but in all there were eight full sheets of stickers, five mini sheets, and five singles - a bit more than twice what I got in the petite pack, just as the description stated. In addition there was also a quote card and a postcard that you can cover with stickers and send to a buddy. The exact number of sticker sheets per month will vary, but it seems you'll get more bang for your buck if you pay the extra $5 a month for the Classic. As far as quality, most of these stickers aren't just any ol' design that you'd find at the dollar store. Many of them are from foreign countries and feature the cutest illustrations. Fifteen dollars might sound steep, but good quality stickers are expensive (my six-year-old self can attest to that) and these would easily run $2+ per sheet before any shipping costs. Have you SEEN how much the tiny embellies go for at Walmart?! Sometimes it's $5 just for a single (albeit fancy) sticker! If you're just looking for sheer quantity of stickers say, for a 1st birthday party, you might be better off picking up cheaper ones in bulk since most will likely get tossed in the trash afterwards, but if you're a sticker aficionado and want to send a special message to a loved one, you only want the best, and Pipsticks does offer some great pickings. 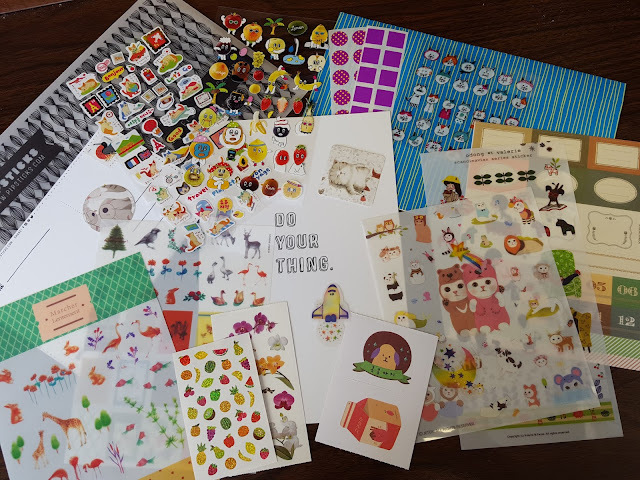 If at any point you find yourself in sticker overload, Pipsticks makes it easy to skip a subscription right from your account. I'm hoping they open an online store soon because they have such unique stickers and to be able to find all those stickers in one place would be the best thing ever. Are you a sticker lover? Join Pipsticks now and get $5 off your first order! I seriously can't stop smiling every time I open up this subscription! I'm so glad those dog ones were in the petite version, too, because they were my favorite, too. :D.
Thanks for the review, I've been curious about the difference in versions.